The four faced Buddha – a misnomer? The four faced Buddha at the Erawan Shrine, Bangkok has four faces but it isn't Buddha. It is actually Lord Brahma who is one of the Trinity of Hindu Gods. The other two are Lord Vishnu, the sustainer and Lord Siva the destroyer. Brahma is said to be born from a lotus leaf sprouting from the navel of Vishnu. 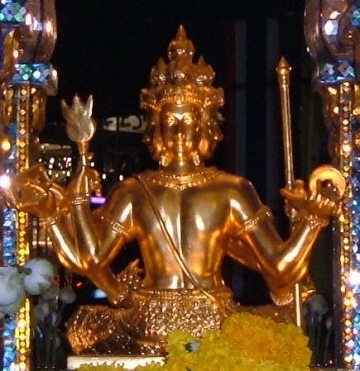 The Thais call Brahma, Than Tao Maha Prom or Phra Phrom. The golden swan, the mythical steed of Brahma, is also revered in Thai culture. The royal barge, Suphannahongsa was named after the golden swan, which has been the name of the King's personal barge since King Rama I. Over the years, Brahma's knowledge and power has granted the wishes of many. Word of the power of this famous deity has spread far and wide and the legend of the Erawan Shrine has been the source of hope and sustenance. Thais and ethnic Chinese from SE Asia, Taiwan and Hong Kong, who are mainly Buddhists and Taoists, flock to the shrine to pray and seek the blessings of the four-faced Brahma. The four faced statue at the Erawan Shrine is a Hindu legacy in Bangkok that has become a fusion of faiths. Your prayers answered at the four faced Buddha? Hundreds of devotees pray every day and night at the Erawan Shrine or what’s commonly called the four faced Buddha. Were your prayers answered? What was the ritual you went through? How did you feel when you got what you prayed for? Did you go back again? Share your story of good fortune with us. Read the stories of others who have had their prayers answered. for the 2nd time ! Four-faced Buddha - prayers answered. When is the four-faced Buddha's birthday? Tomorrow? Nov 9 ? Four faced Buddha saved my life! To return to the Erawan Shrine and for other Bangkok Shrines. This is my first e-book and if you are an independent traveler, this handy e-guide book will help you along as you explore the streets of Bangkok and discover its old treasures. It's complete with historical descriptions, maps and detailed directions on how to get to these places.